Not everyone is born to be a performer. It’s just you centre stage, all eyes staring in anticipation – auditorium lights blinding you, at once keeping audience faces at bay and making your forehead glisten with sweat. You’re ready to pour every last ounce of your passion into this performance. And all this as a 21-year old fulfilling a lifelong dream of being an opera singer?! Not all of us can say that we’ve experienced this feeling, but Jacob has. Ever since he discovered his unique love for operatic music, Jacob has sought it out. The path Jacob chose is arduous. There is great pressure to conform to societal norms and look for a stable job with a consistent salary. Jacob recalls when, even his father, a supporter of the arts and of Jacob’s passion, requested that he apply to a degree in actuarial science. “I got in on early acceptance”, he added. However, Jacob’s devotion to the world of opera runs deep enough that no obstacle is too great to overcome. He holds strong in the face of opposition, knowing that the musician inside of him is worth setting free, and it has already paid off. Jacob knows the importance of perspective and is embracing the challenges and successes he experiences. “We all have bad days; we’re all human.” The bad days, Jacob tells, is part of what makes life beautiful. True beauty, Jacob understands, is a composite of all of life’s experiences, and only in remaining true to oneself can one’s inner beauty be revealed. Jacob Feldman is 21 years old and grew up in Thornhill. He attended Jewish day school- Netivot Hatorah Day School and TanenbaumCHAT’s Kimel Family Education Centre. He has just completed his undergraduate degree at the University of Toronto and graduated with Honours from the Bachelor of Music in Performance. Along the way, Jacob has performed in numerous shows such as Mozart’s Così fan tutte, Bizet’s Carmen and Offenbach’s Orphée. He also started his own opera company called the Toronto Lyric Opera Centre. Growing up, his family home was filled with classical music, as his maternal grandparents were both passionate about the arts and would do the same in their home. 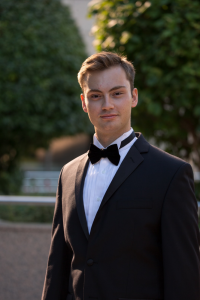 Having just graduated, Jacob is spending his summer at The Music Academy of The West, where he is one of twenty-two fellows chosen to learn and perform throughout the summer. Next year he will be attending the Royal Academy of Music in London, England for a Master of Arts in Performance.